There has been significant growth in the number of therapy dogs and assistance dogs, helping people with a range of disabilities, medical conditions and mental health problems, according to the RCN. This means dogs are increasingly visiting healthcare settings and care homes. A survey by the RCN in 2016 found that although the majority of more than 750 nurses thought animals were beneficial to patients, most said animals were not allowed in their workplace. Concerns about bringing dogs into clinical environments include safety and infection control. New guidance from the RCN supports nurses to plan and bring dogs safely into hospitals and other healthcare services. The protocol provides evidence-based best practice criteria for animals in a way that is safe for patients, staff, the animals and their owners. It covers the use of assistance dogs, which can provide support for people with a wide range of conditions, including sight and hearing difficulties, mental health problems, epilepsy, diabetes and autism. They are generally with their owners 24 hours a day and provide practical support, companionship and help in dealing with anxieties. The guidance also looks at animal-assisted intervention, the most common form of which is animal-assisted activity. 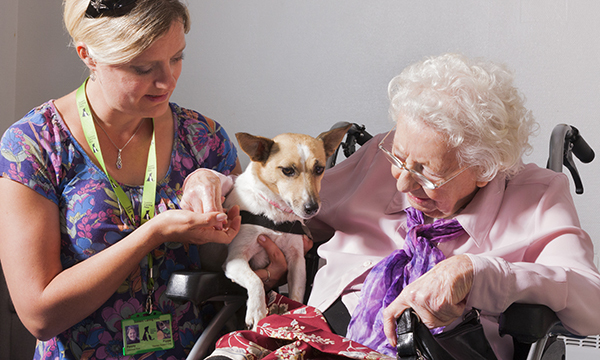 This involves a handler bringing a dog to the patient or resident who can stroke and interact with them. The RCN recommends that in general pets are not allowed access to healthcare settings, except in exceptional circumstances, such as to visit a person in a hospice. Managing infection prevention control, allergies and health and safety are all covered in the document. For animal-assisted intervention, only allow dogs and handlers approved by a recognised and reputable charity or organisation. These organisations will provide clear identification for both the handler and the dog, which should be checked by healthcare providers as part of the preparation for the visit. When dogs visit, hand hygiene must be maintained and, if a dog is getting up on a bed, put a protective pad, such as a continence pad, under their feet. The dog should not be allowed to lick anyone and not be allowed to sit fully on the bed and, in particular, not near a person’s face. The dog should be clean, well-groomed and not fed raw food. All dogs should be on a lead, under control at all times, and wearing a jacket or other clear ID to show it is a therapy or assistance dog. Each active session should be no longer than an hour. ‘I have seen dogs have an amazing impact on the care of older people, including with reality orientation, by helping people stay in the moment, and reminiscence therapy. The dogs can trigger long-term memories, as people recall family dogs from the past. People have told me about how they had worked as dog breeders or trainers in the past. Sometimes families had not even heard these stories before, and they can be useful for healthcare staff to continue with memory work. These memories can bring residents’ and patients’ talents and skills to the fore, which can sometimes be forgotten in care settings. ‘The RCN guidance will really help nurses who want to bring dogs into their care setting to plan a visit. We have also found that memorandums of understanding are helpful with hospitals, as they set out the responsibilities on both sides. The volunteer is always responsible for the dog. Should nurses have to report young people at risk of being caught up in knife crime?